A splendidly-named Civilization modder, GrrrArrrg, has released an environment reskin for Civilization VI that recreates the look of Civilization V. Better yet, GrrrArrrg is actually Brian Busatti – Civ VI’s art director. Busatti was challenged by his colleagues at Civ developer Firaxis to “create an example environment skin using only the tools and off-the-shelf modelling software” – so, no internal dev tools. 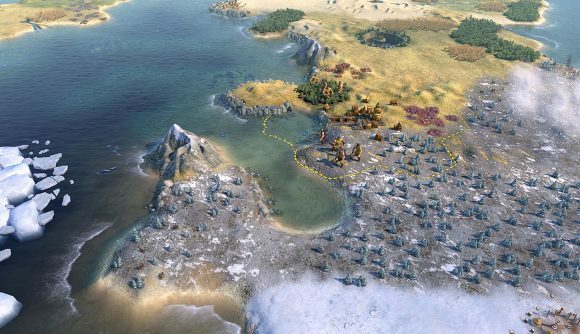 He came up with a total environment conversion, and a clear demonstration of just what’s possible with Civ VI’s basic SDK and other readily available tech. Details, and more gorgeous screenshots, are on this thread at CivFanatics. This is a pretty big deal given how limited Civ V’s SDK was when it came to graphical modding. Ahead of Civ VI’s release, we spoke with some of the community’s best modders, and this area was universally agreed to be a weakness with the previous game. In this respect then, Civ VI has been a clear improvement. You can sample the results for yourself at Environment Skin: Sid Meier’s Civilization V on the Steam Workshop. It’s compatible with every version of the game, up to and including Gathering Storm. When it was first revealed, Civilization VI’s art style was pretty controversial. Featuring warm colours and cartoonishly-proportioned character models, its look seemed inspired by the Civilization Revolution mobile spin-offs, and alienated Civ’s more traditional fan-base. Personally I found the new look a little jarring at first, but I’ve adjusted to it since and I really enjoy its warmth. Many players haven’t been able to get to that point, though, so it’s great that a mod now exists to help them enjoy Civ VI. If you’d like a rundown of other great ways to modify your game, we’ve a list of the best Civ 6 mods for you to look at. If we’re honest it could do with an update, but everything there is still worthwhile.